Security Doors - Beejay Home Improvements, Inc. Replacement of Storm Glass or Screen, Door Hanging, Installation of Door Strikes, and Door Frame Repair. Call 716-894-8989 To Schedule a Service Call for Security Door Repair. 4. We Install Your Steel Door the Same Day! When it comes to Residential Security Doors, Beejay Home Improvements, Inc. is your number one resource in Buffalo, New York. We Install High Quality "Made in the USA" Steel Security Doors which are Powder Coated for a durable, long-lasting finish. ​ We Repair, Rebuild, or Replace Any Size Door. Call 716-894-8989. Home Installation of Security Doors in Buffalo is our Specialty. Our installers are experienced in the repair, replacement, or installation of Steel Security Doors. Now is the time to upgrade the look and security of your home. You can visit our Showroom at 1588 Broadway in Buffalo and SEE the variety of High Quality Steel Security Doors we have on display. Many styles to choose from! Our Steel Screen Security Doors combine Security with Style and Utility. Beejay Security Doors are High Quality and made with US Steel. Give us the opportunity today to serve you. Call us at 716-894-8989 or visit our SHOWROOM at 1588 Broadway in Buffalo, NY 14212. We offer a variety of choices and styles that are sure to match the character of your home. Our Steel Security Storm Doors are made with 16 gauge "Made in the USA" Steel. ​Protect your home and your interior door from the elements and home invasion. Visit our Showroom at 1588 Broadway in Buffalo. Are you looking for a particular style of Ornamental Security Door? ​We have many selections to choose from, all made with high quality US Steel. ​Visit our Showroom at 1588 Broadway in Buffalo 14212. Beejay Home Improvements, Inc. has a Double Security Door to suit every need. ​Double Security Doors are available for French Patio Doors and for Sliding Patio Doors. We repair, replace and install beautiful, modern, custom design Security Doors for your residence. Imagine the dramatic change to your home when your replace your current Entry Door with a Wrought Iron Door. ​Let us show you our wide selection of Wrought Iron Security Doors that are sure to enhance the character of your home. ​Beejay Home Improvements, Inc. Specializes in the Installation of Wrought Iron Security Doors in Buffalo, New York. We Install Custom Swirl Iron, Traditional Scroll Iron, and Abstract Iron entry door designs. Make the Entrance to your Home EPIC with the Installation of a High Quality WROUGHT IRON Security Door Today. Call 716-894-8989. Security, Comfort, and Style are important when it comes to your home. ​Beejay Home Improvements, Inc. has many Styles of Security Doors guaranteed to match the decor of your home. 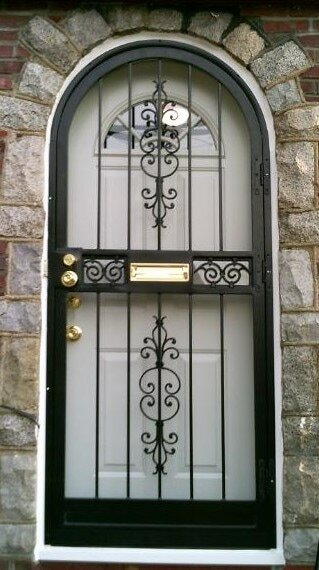 We carry Wrought Iron, Ornametal, Custom, and Double Security Doors in ALL Sizes and Colors. ​Visit our Showroom and See the Quality of our "Made in the USA" Steel Home Security Doors. 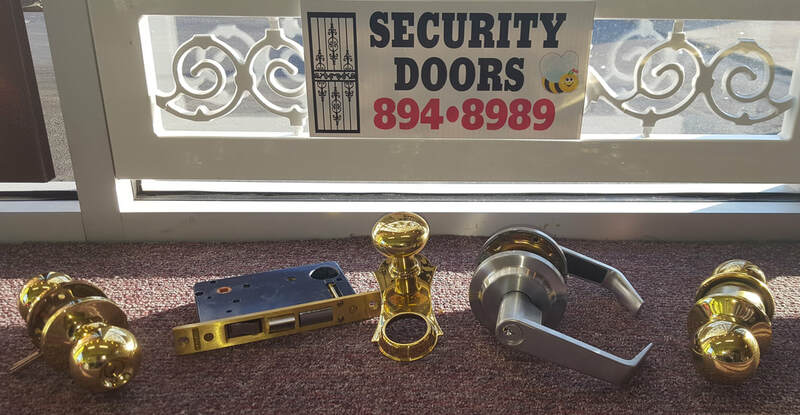 Our Service Technicians install a full line of Security Door Hardware, including: Dead Bolt Locksets, Hinges, Mortise Locks, Security Latches, Security Plates, Security Door Strikes, Steel Door Guard Plates, Security Door Pumps, and Steel Door Closers. We repair or replace ANY Size Door, ANY Style. ​We Service or Sell Hardware Brands, including: Marks, Baldwin, Yale, Medeco, Schlage, Kwikset, Corbin Russwin, Mul-T-Lock, RR Brink, ASSA-Abloy. Call us at 716-894-8989 to Schedule a Service Call. Have A Question Regarding Security Doors?